The full foredeck assembly consists of the bulkhead, winch, ladder and opening. The winch is for an anchor which I haven't added to the ship yet. 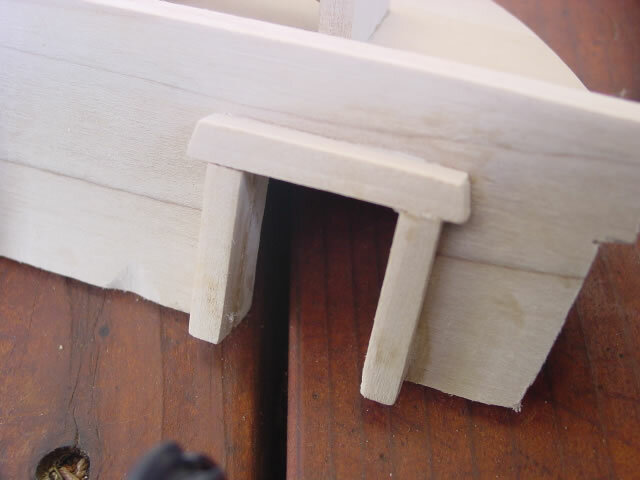 After cutting the foredeck to shape, hold a scrap piece of 1/4" board on an angle to see if the bulkhead would clear the mast hole. I had to trim back the trailing edge of my foredeck a few times to get it right. This edge was cut at a 12 degree angle. Be certain you're cutting back enough to clear the mast location, but don't go beyond the main deck. Once you have the foredeck trimmed, cut some paper or cardboard to shape and get the piece to fit the sides of the hull. My bulkhead piece sticks up 1/2" above the deck, making it flush with the side of the hull. 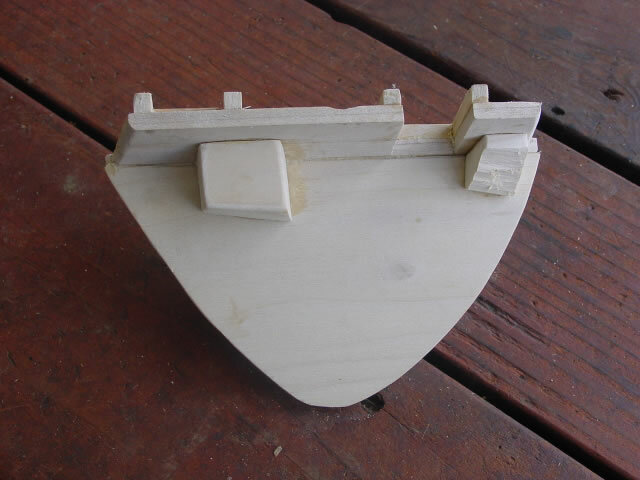 The top of the bulkhead is cut at a 12 degree angle so it ends up being flat and horizontal, and the sides were sanded and trimmed a bit at an angle to try and match the curves of the hull. I added two blocks of scrab inside to help support the bulkhead. They are cut at the same 12 degree angle. Cut a 1" notch out of the bulkhead for the ladder so it's flush with the foredeck. The sides are made from 1/4" square pieces, cut at an angle (12 degrees, again) at the top and bottom. 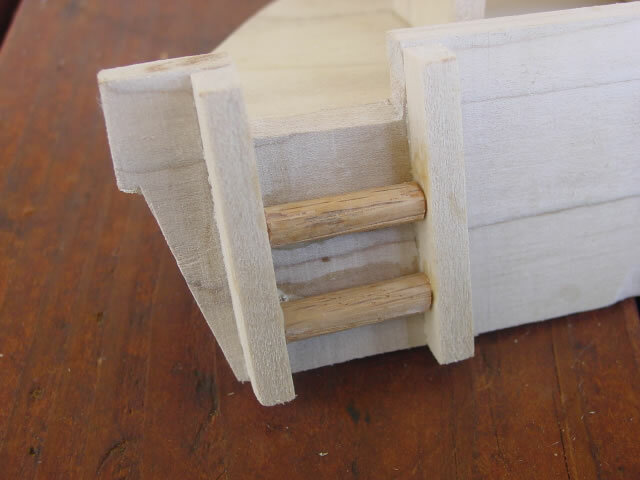 The oak dowel pieces are cut to fit snug across. Sand them a bit flat on one side to give a bit more surface for gluing. The doorway is 1" wide and 1 1/4" tall. Add 1/4" square trim on the sides and top. 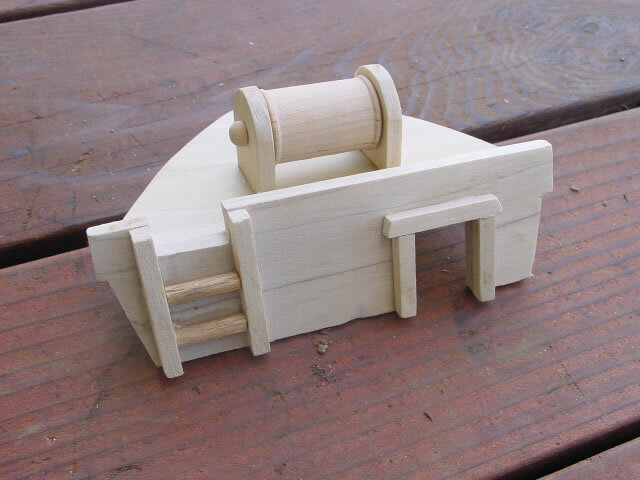 Make the top piece a little longer and angle the ends if you like the way that looks.